The Governments Environmental Risk Management Authority [ERMA] now known as the Environmental Protection Authority [EPA] has established for the first time clear rules around teeth whiteners containing hydrogen peroxide and their use. The Authority’s decision includes requirements for labelling of over-the-counter OTC tooth whitening products such as you would find in a Chemist, Supermarket, Beauty Salon, Spa, Gym, and the like. It also divides tooth-whitening products into three categories and places sale and use restrictions on the highest two of these categories, including requiring dentist supervision of the products posing a higher risk to public safety. Following the New Zealand Cosmetic Teeth Whitening Association’s [NZCTWA] submission to the ERMA of a number clinically proven safety studies conducted by globally recognised authorities (such as the Eastman Institute for Oral Health, a recognised world leader in dental research) rebuffing what appears to be exaggerated claims of dentists lobby groups, teeth whitening products containing less than 7 percent hydrogen peroxide will continue to be available to the public and used and sold without restriction. Cosmetic Teeth Whitening Practitioners may continue to use products containing 7-12 percent hydrogen peroxide. Products containing more than 12 percent hydrogen peroxide will only be able to be used under the supervision of a dentist. It should be noted that most independent cosmetic teeth whitening practitioners of the Appearance Enhancement & Beauty industry in NZ already use new safer whitening systems meaning the new ERMA safety requirements for Cosmetic Teeth Whitening Practitioners have already been voluntarily in place amongst the majority of NZCTWA members for some time. The ERMA committee also noted the express willingness of the Ministry of Health (MOH) to work with the NZCTWA to develop health safety guidelines for Teeth Whitening; this was welcomed and the NZCTWA Executive and subsequently representives have met. The MOH has reviewed the NZCTWA’s Code of Conduct & Practise, particularly the Codes provisions for Health, Safety and Hygiene protocols and all MOH recomendations are being implemented. - see NZCTWA media release and full ERMA Public Safety Rules. 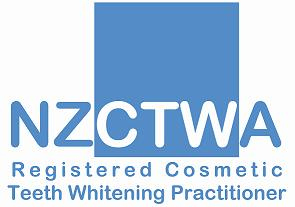 Dealing with a NZCTWA Registered Teeth Whitening Practitioner displaying NZCTWA Registration is your assurance that you're dealing with a professionally trained, qualified and safe Cosmetic Teeth Whitening Practitioner who takes a pride in the quality of their service and care.